Post subject: Can the Quran abrogate a Sunna? He quotes a hadeeth, narrated by Uthmaan ibn MaZh`oon (and the same event happened with `Ammaar ibn Yaasir) that he passed by the Prophet (PBUH) while he was praying and greeted him and the Prophet (PBUH) returned the greeting. Then Sahl ibn Salaam (and other scholars such as Sufyaan ibn `Uyayna) have ruled that such practice is now abrogated by 2:238. Al-Hamdaani acknowledges that these narrations are either Mursal (open-ended) or Munqati` (disconnected), thus casting doubt on their authenticity. But he says there are more authentic reports that confirm it. For instance, Ibn Mas`ood reported that he once greeted the prophet (PBUH) while he was praying and he returned the greeting, but later he did the same and the Prophet did not return the greeting. After he finished praying, the Prophet said to all people who were in the mosque, "God has updated the prayer (أحدث في الصلاة) that you should not say but the remembrance of God and that you should be vigil (قانتين) in it." In another version, Ibn Mas`ood (RA) says that this change happened after Muslim migrants returned from Abyssinia and the Prophet's words were "God adds new commands of His (يحدث من أمره) as He wills and He has updated the prayer..."
I looked up this hadeeth and it was rated authentic by Al-Albaani only. The second version seems more authentic. Ash-Shaafi`i, Abu-Daawood and Ibn Hajar among others have all rated it with words like "established", "sound" and "authentic." The other example Al-Hamdaani cites is not attributed to the Prophet (PBUH), but rather is an observation by Zayd ibn Arqam. That report is rated authentic by Muslim. The fact that the Quran can and did abrogate some Sunna does not automatically mean that the reverse is also true, nor does it mean that abrogation within the Quran is also true. The Prophet (PBUH) did not use the word "naskh", but the scholars did. Even though the word can mean "to update", which is the word the Prophet used. It's as if the Prophet (PBUH) wanted to avoid using the word. I wish the scholars followed his lead in this regard. The other version of Ibn Mas`ood's narration makes it clear that 2:238 was a new command from God. This is crucial to understanding why the talk about naskh may not have been talk about abrogation at all. As commands from God and His Messenger were unfolding, the sum total of them constituted the whole commands, not any one of them. The Quran was not complete until it said it was (in 5:3) and the Sunna was not complete until the Prophet (PBUH) died. A command stated by either would only be an abrogation if it said it was! Agreed, and this is an important case that establishes with significant evidence abrogation of sunna (more convincingly by hadeeth since the above hadeeths are explicit in what they say while the verse can have multiple interpretations). The other example that I recall was authentic was about visiting the graves, and in that case the abrogation was done through a hadeeth. He changed his habit and started looking down. The hadeeth reporting this event is narrated by Ibn Seereen and Al-Hamdaani acknowledges that it is open-ended but that there are other reports that confirm it. I have no problem believing this, but I would not call it abrogation, since the Prophet (PBUH) did not order anybody to look up during the prayer, nor was there ever a command from God to do so. This is a simple case of God correcting an improper assumption of people. It is education, not abrogation. Totally agree. The notion of abrogation seems to have taken a life of its own. And the prophet stopped cursing anybody ever since. The hadeeth reporting this event is authentic, reported by both Al-Bukhaari and Muslim. That said, this again is not a case of abrogation, but of education. There is no reason to believe that cursing enemies during prayer was meant to be a Sunna! It was a letting off of steam that God clearly did not approve of. Another example of abrogation, Abu-Bakr Al-Hamdaani suggests in his book الاعتبار في الناسخ والمنسوخ من الآثار, pages 77-79, is the prohibition of reciting Al-Faatiha (Chapter 1) during a congregational vocal prayer where the imaam (prayer lead) recites it. The Sahaaba stopped doing that. Al-Hamdaani says that Abul-`Aaliya's hadeeth is disconnected. I don't see a case of abrogation here, nor do I see a reason why the Sahaaba stopped reciting. The hadeeth clearly says that the Sahaaba recited after the Prophet finished reciting. Thus, they did pay attention to the Prophet's recitation and therefore complied with 7:204. 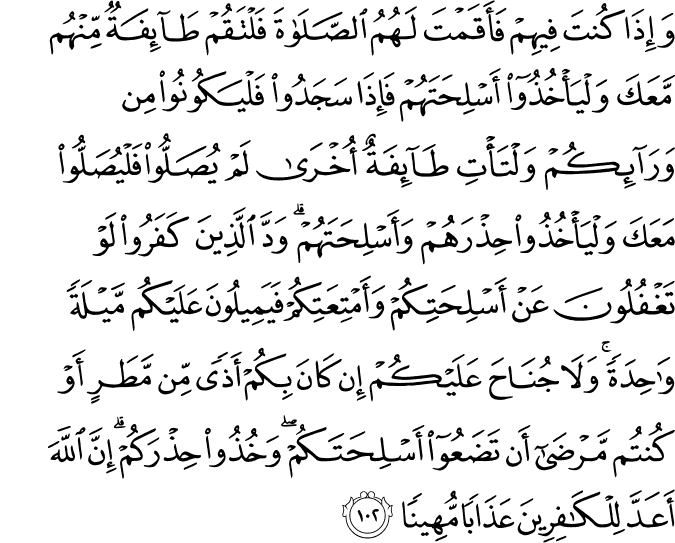 Al-Hamdaani reports a hadeeth, narrated by Abu-Hurayra, in which the Prophet (PBUH) asked the people if they recited. They said they did. He replied, "Why am I wrestling with the Quran?" So, people stopped reciting. Al-Hamdaani casts doubt on the authenticity of this hadeeth. I looked it up and it seems reasonably authentic. It was narrated by Abu-Daawood and An-Nasaa'i who rated it authentic and by At-Tirmizhi, Ibn Hajar and Al-Albaani who rated it "sound." I find this hadeeth pivotal! It clearly states that when a Sunna contradicts the Quran, the Prophet (PBUH) wants us to follow the Quran. That should have been an obvious conclusion of every Muslim, but alas it's not what many Muslims have done. Indeed, several scholars have ruled that reciting Al-Faatiha is mandatory in every prayer, including congregational vocal prayer, even as the imaam is reciting it out loud. That ruling was made by Al-Awzaa`i, Abu-Hurayra and Ash-Shaafi`i. Their argument is that the authentic hadeeth unequivocally states that no prayer is accepted if the person does not recite Al-Faatiha. I can't understand why these prominent scholars did not consider the other hadeeth, reported by Jaabir ibn Abdillah and reported by Al-Albaani who rated it "sound", and by Ibn Maajah who rated it authentic, in which the Prophet (PBUH) said, "Whoever prays behind an imaam, the recitation of the imaam is a recitation for him"? Or why did they not consider the authentic hadeeth, reported by Muslim and An-Nasaa'i and narrated by `Ataa' ibn Yasaar and Zayd ibn Thaabit, in which the Prophet (PBUH) said, "There shall be no reciting with the imaam at all!"? I also find it rather strange that Ash-Shaafi`i, who is famous for rejecting the notion that the Hadeeth can abrogate the Quran or vice versa, would rule for a hadeeth over the Quran. Isn't it obvious that the mandate to recite Al-Faatiha only applies to silent or individual prayers and the prohibition only applies to vocal congregational prayers? Isn't that a reasonable reconciliation of all the hadeeths with the verse? The scholars have agreed that reconciliation annuls a claim of abrogation. Even today, prayer leads tend to take one of two approaches to this issue. Some deliberately pause after recitation, leaving time for people behind them to recite. That is a decent thing to do. It avoids controversy and reconciles all opinions. Others deliberately do not pause, forcing people behind them to either skip reciting or recite with them. If they choose the latter, they would be violating the Quran! Abu-Bakr Al-Hamdaani cites another example of abrogation by the Quran of a Sunna. On pages 90-92 of his book الاعتبار في الناسخ والمنسوخ من الآثار, he reports that the battle of the trench kept Muslims away from prayer, out of fear that the enemy may take the opportunity to assault them while they were praying. They missed three prayers: Zhuhr, Asr and Maghrib! So, what did the prophet do when the battle was over that night? He had Bilaal call for the prayer and he prayed Zhuhr, then had him call again for the prayer and prayed Asr then had him a third time call for the prayer and prayed Maghrib and finally a fourth Azhaan for Ishaa'. This is a valid claim of abrogation, because the action of the Prophet (PBUH) carried on to all Mulims who were with him and that establishes it as a Sunna. However, it should be noted that there was no prior command from God to the Prophet (PBUH), as far as I know, about how, or whether, to make up for missed prayers, or how to pray when in a state of fear. Abu-Bakr Al-Hamdaani mentions something quite interesting in his book الاعتبار في الناسخ والمنسوخ من الآثار, page 92. He reports that the Friday prayer has evolved! He reports a narration by Muqaatil ibn Ħayyaan that the Prophet (PBUH) used to pray Jum`a before the Khutba (sermon), similar to how the Eid (Feast) prayers are done. One day, after the Prophet (PBUH) finished the prayer, he started to deliver the sermon, when a man named Diħya ibn Khaleefa had just arrived from a trade trip and brought with him many goodies. His family received him with drumbeats. People in the mosque went out to check it out, thinking that hearing the sermon was not mandatory. Then the Prophet (PBUH) reversed the order: he started preaching first then praying afterward. People now could not leave the mosque without taking permission first from the Prophet (PBUH) using hand signals. I find that, if authentic, to be a valid case of abrogation, because the consistent practice of the Prophet in a matter of the religion is Sunna. Abu-Bakr Al-Hamdaani makes an easily refutable claim of abrogation of a Sunna by the Quran, in his book الاعتبار في الناسخ والمنسوخ من الآثار, page 102. He reports the event of the death of Abu-Taalib and how the Prophet (PBUH) kept urging him to accept Islam before he died. But Abu-Jahl and Abdullah ibn Umayya kept countering and saying to Abu-Taalib, "Are you going to abandon the religion of Abdul-Muttalib?" Sadly, Abu-Taalib succumbed to the pressure from his brother and died a polytheist. The prophet (PBUH) said, "I will ask God to forgive you unless I'm forbidden to do that for you." (translation and emphasis mine). abrogated that Sunna. But the Prophet (PBUH) also said what I emphasized in italics, therefore the above two verses provide the prohibition that the Prophet (PBUH) was anticipating. So, where is the cause for an abrogation claim? If one wants to prove that abrogation of a Sunna by the Quran can, or has happened, this particular claim would be an invalid example. The example of fasting on the 10th of Muharram (`Aashuraa') is one example often cited in the literature to show that abrogation did happen. Abu-Bakr Al-Hamdaani discusses this in his book الاعتبار في الناسخ والمنسوخ من الآثار, pages 103-105. He reports how scholars agree that it is no longer required, because fasting in Ramadhaan took its place, but that they disagreed on whether it was ever mandatory. He reports several authentic hadeeths that make it clear that the Prophet (PBUH) fasted it and ordered Muslims to fast it. That is why many scholars concluded that it was mandatory. But Al-Hamdaani reports two other authentic hadeeth, one narrated by Ibn Umar and the other by Mu`aawiya. Both make it clear that the Prophet (PBUH) said that "God did not mandate the fasting on `Aashuraa' day, but that he, the Prophet, fasts it and whoever wishes to can do the same." Despite this, some scholars kept saying that it was mandatory before but no longer, as it was abrogated by Ramadhaan. Ash-Shaafi`i concluded that the other hadeeths must therefore mean that the Ramadhaan fasting mandate abrogated the `Aashuraa' fasting recommendation. I regret having to disagree. That fast was and remained an emphasized Sunna. Perhaps Ash-Shaafi`i meant was that the emphasis was reduced. I'd agree to that, because the emphasis was done at first with action and an imperative and later was done with action only. But is that really abrogation? The end result remains the same: it was a strong recommendation and it still is. Al-Hamdaani concludes that these later hadeeths were meant to clear any confusion that Muslims may have had and make the point that fasting on `Aashuraa' is not required, only recommended. I agree but add that it was never required. The words of the Prophet (PBUH) are very clear: "God did not mandate.." Not every imperative is a mandate. An imperative can be a mandate or a recommendation. In discussing whether abrogation has happened, citing this example, therefore, would be a flawed argument IMHO.